You’ve never seen London Bridge, even if you grew up in London. You may have seen a bridge called “London Bridge”, but it’s not the famous bridge of verse and song. The real London Bridge is gone, though it didn’t fall down. It was simply replaced by something more modern. Let’s take a look at the story behind this icon. Upstream from London, the River Thames acts like a normal river, but downstream it becomes a tidal estuary. The tidal part of the river is low and wide, and when the tide comes in, the water can travel upstream. The Lower Thames is, in many ways more ocean than river. And up until a hundred years ago, it was impossible to bridge. From the days of Ancient Rome all the way to the Victorian Era, London bridge was the most downstream bridge on the river. That’s why London became the biggest city in England. It was the best point to control both banks of the river. The first London Bridge was probably built in a Roman times. In their conquest of Britain, the Romans spanned the Thames with a series of pontoons. As they built up their capital on Londinium, they replaced the pontoon causeway with a wooden bridge. That bridge was destroyed by Boudica and was later rebuilt. Throughout the Middle Ages, the bridge was destroyed and rebuilt over and over again, as warring factions fought for control of London. Of all the bridges that have spanned the Thames, the most famous was completed in AD 1209. This was the first stone bridge in London, and despite the centuries of war and natural disaster, it stood in place for over 600 years. This London Bridge was not a pretty one. It was built on nineteen irregularly space arches, with a drawbridge to allow ships to move upriver. Even more notably, the bridge was covered with buildings. All along the bridge, there were several stories of shops and houses, leaving only a narrow alleyway for passing traffic. But London Bridge’s most infamous feature was its southern gatehouse. As the entrance the a walled city, the bridge was fortified, with guards stationed on the southern end. Above this gatehouse were pikes with the heads of condemned criminals, serving as a warning to all who entered. By the 18th Century, the old medieval bridge was woefully inadequate. 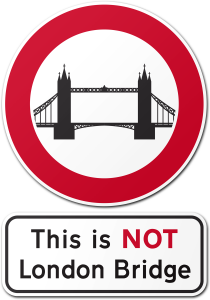 The City of London demolished the buildings on the bridge, and added a widened span for increased ship traffic, but even these measures weren’t enough. So in the early 1800s, a new stone bridge was built upstream. The replacement bridge was twice as wide as the old, with just five arches to allow for increased river traffic. Once the new bridge was completed, the old Medieval Bridge was demolished. (Despite what the song says, it did not fall down.) The new bridge was an immediate success, but as they say, “They don’t make ’em like they used to.” The replacement bridge was built on unstable footing, and by the mid-20th century, it was clear that it would have to be replaced. The modern day London Bridge was completed in 1973. It is built from prestressed concrete, and resembles a simple highway overpass you’d see anywhere in the world. Meanwhile the 19th century London Bridge was dismantled and rebuilt in Lake Havasu City, Arizona. (Though contrary to popular belief, only the exterior stone cladding was rebuilt. Underneath the stone is a 1970s-era skeleton.) In any case, the London Bridge in London is nothing spectacular, leaving tourists to look for something more striking. For over 1,800 years, London Bridge (in all its incarnations) was the easternmost bridge of the Thames. But as the East End of London grew in size and importance, the need for a bridge downstream became more and more important. This led to the construction of Tower Bridge. Thanks to the Industrial Revolution, Londoners could have a modern suspension bridge over the river, with a steam-powered drawbridge element to allow for river traffic. But since this was the Victorian era, this marvel of modern engineering was clad with a medieval skin that matched the nearby Tower of London. The result is a striking design that is one of the wonders of the world. It’s so striking, in fact, that many tourists confuse it for London Bridge. This is an insult to both the long medieval history of the real London bridge and the marvel of Victorian-era engineering. 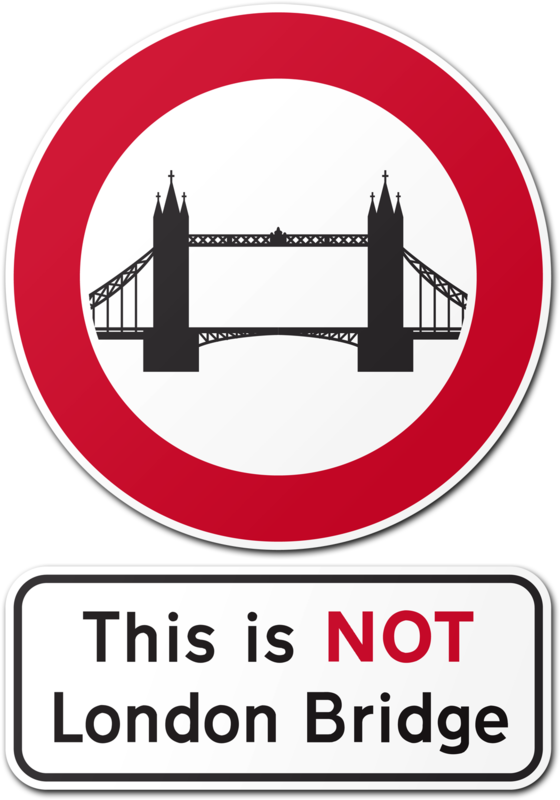 Though it’s one of the most famous bridges in the world, the ugly truth is that London Bridge simply does not exist anymore. Like Penn Station in New York, it was an iconic structure torn down and replaced with a cheap imitation. So if you want to see the real London Bridge, either go back in time or convince the City to build a worthy replica. And as for Tower Bridge. Enjoy it for what it is, a marvelous piece of 19th century engineering, and a worthy landmark in its own right.